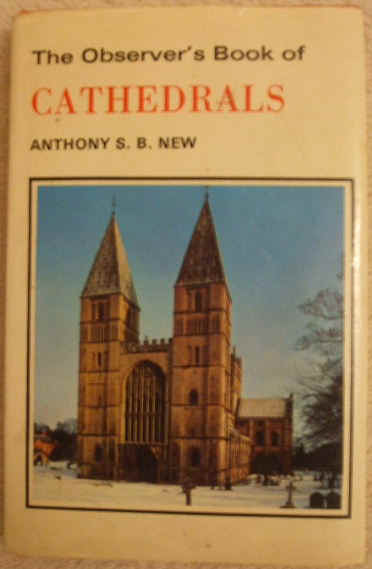 First edition hardback of THE OBSERVER'S BOOK OF CATHEDRALS by Anthony S. B. New and published by Frederick Warne & Co. Ltd., London in 1972. The Observer's pocket series No.43. With 16 full-page plates and over 250 illustrations in colour and black and white. The book is in good condition (Clean red boards and black lettering on spine and front which has slight creasing to the spine edges) with only slight wear to the dust jacket, which is price clipped but with the publisher's printed sticker of 75p on the inside flap (slight creasing to the edges and slight yellowing towards the edges). Internally, the pages are clean and tight and there are no tears and no inscriptions. The observer's pocket reference series first started in 1937. Its aim is to provide an introduction to a wide range of interests. They have also been popular amongst children. They have become collector's items. The first few Observer's titles had focused on nature, but gradually subjects like geology, music and architecture were introduced. This is No. 43 in the series. "Few of us are left unmoved by the towers and pinnacles of a great cathedral rising above city roofs, and few can resist an invitation to step aside and marvel at its soaring columns and vaults, its rich carving and glass and, if we are fortunate, its music and ceremony. Mr. New, a practising architect, tells us what cathedrals are for, and goes on to explain how they developed in the course of the centuries. Detailed descriptions of every cathedral in Britain are accompanied by simplified plans in full colour to indicate at a glance the different styles of building. Not only the Anglican but also the Roman Catholic cathedrals and many abbeys and priories are included in order to broaden our understanding of these great buildings. With the pace of modern travel we are as likely to find ourselves in Erfurt or Evora or Evreux as in our own Ely or Elgin, and the author devotes a generous part of the book to continental examples, explaining their national variations in plan and details. Altogether some 350 cathedrals are covered." Pocket size 5.75 x 3.75 inches. 199 pages. Includes architectural glossary, index & maps showing the principal cathedrals of Spain, Portugal, Italy, Yugoslavia , Germany & adjoining countries and England and Wales, illustrated endpapers show parts of a cathedral. Illustrated with colour and black & white plates.